The ASC web site had its humble beginnings while Ken Williamson III, was at Illinois State University. Ken have never experienced a university or department so advanced in computer technologies. A faculty member by the name of Dr. Wayne Nelsen took ISU’s Department of Industrial Technology to the pinnacle of this communication tool, and the faculty were farsighted enough to ride his wave into our future. While there, Ken took for granted the seemingly unlimited access to new technology and its applications in construction education and our industry. 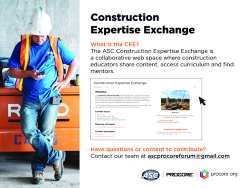 As a result, Ken founded the ASC web site in 1994 out of the desire to provide a significant contribution to construction education by enhancing the communication between the ASC membership and faculty. Ken’s tenure in the construction industry and work within construction education taught him one thing above all others – Success, in the business and academic environment, is proportional to one’s ability to access and control information. Indeed today’s technological societies are more information managers than anything else. We are continually bombarded with information from all directions, and as so eloquently stated by Ken “often the biggest challenge is sifting through the rubbish and trying to find some order in the chaos.” Ken often told students in class that one of the most significant advancements in business today was the cellular phone. Today’s construction manager would feel seemingly powerless without the connectivity that it provides. The technology has developed so rapidly that we often take it for granted, but consider the impact that wireless communication has had on a contractor’s ability to manage his flow of information. The Internet revolution offers the same type of connective opportunity by increasing the effectiveness of information exchange by seamlessly integrating our knowledge and work within construction education. To Ken, this web based communication strategy came only naturally. The sheer power of information and the ease of access provided by the Internet made this web site a logical step in the services provided by this organization. Please be aware, that none of what you see here would have been possible without untold of hours of staring blankly into a computer screen at lines and lines of code. But that is only part of the story. Without you and your input, there would be no information to share. This is your web site and you are responsible for what it provides. We must all be active participants for this web site to be effective in improving the flow of information and communication between members.